How much does it cost to travel to Wuyuan? How much money will you need in Wuyuan? The average price of food for one day is ¥9.00 ($1.34). Additional pricing is in the table below. These average travel prices have been collected from other travelers to help you plan your own travel budget. How much money do I need for Wuyuan? Wuyuan, China is a small city in the Jiangxi Province in the south central area of the country. The city acts as a transport hub for the province, with many main bus routes running through it. Wuyuan also acts as the main thoroughfare when traveling to local remote villages in the area. It is best to know some Mandarin as this region does not see many non-Mandarin speaking tourists, which also means you should expect some very friendly attention! Wuyuan's climate is much like the rest of China's: wet, humid, summers, mild spring and autumns, and bitter cold winters. With that, spring and autumn tend to be the best times to visit, with temperatures in the 70's Fahrenheit. 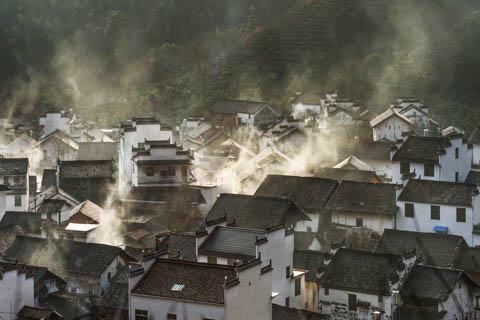 Wuyuan is best known for their stunning, historically rich, villages and temples scattered across the region. The Wuyuan countryside is famed for its beauty and relaxed atmosphere where everyone is happy to say hello and you can even lend a hand in a rice paddy! Keep in mind, most villages require you to pay an entrance fee. There are a few different passes, including a 5-day pass, which allows you entrance into the majority of the villages. In the village of Small Likeng, you'll find a number of beautiful old Buddhist temples to explore along with traditional homes. The Qinghua village is famous for their ancient Rainbow Bridge, which you can walk over and get sweeping views of the valley. Xiaoqi village boasts a peaceful and relaxing atmosphere in addition to their stunning buildings. Wuyuan is essentially divided between the city center and the small villages around it. The city center is fairly small, acting mostly as a transport hub with many bus stations. Food and accommodation are not the best in the city center. Small Likeng: An old village with small pathways built along the creeks. This is one of the best villages to stay in due to number of sights, including a tea house, Buddhist temples, and traditional homes. They also boast beautiful views of the river running through it. Xiaoqi: A duet of villages split into upper and lower end, the latter of which is known as the tourist area with a path guiding you through tourist shops. On your way to the upper end, you'll pass rice paddies where you can politely ask to lend a hand, which will often be greatly accepted! The upper end boasts lovely buildings, a tea house, and an overall more relaxed vibe than the lower end. Sixi Yancun: A more remote village with maze-like streets. This is a very simple village with its main attraction being an ancient bridge. Qinghua: This beautiful little village is famous for its Rainbow Bridge, and ancient bridge which provides outstanding views overlooking the valley. It is also a pleasant place to walk around the river. Hiking is a very popular activity in this area due to the incredible natural beauty of the region. At Dazhang Shan Mountain, you'll find the perfect example of such natural beauty with everything from paved walking paths to huge waterfalls. The people in the area actually claim that the waterfall on Dazhang Shan is the highest waterfall in all of China! There are plenty of spots for resting, including a tea shop near the top, along with areas to perform extreme sports. Enjoy the peaceful atmosphere of Wuyuan from a raft on the river which can be hired. You can also do this along the streams in Small Likeng. The city center does not have the best restaurants, so going to the villages is your best bet for food. Small Likeng has good food, and possibly one of the only English menus in the area at Brook Hotel. Just keep your eyes peeled for restaurants, or even ask a local and they may invite you back for dinner! There are no bars or clubs in the area, but you can often find beer or rice wine at restaurants and guest houses. There are quite a few major bus systems running into Wuyuan, so many that they actually built a new bus terminal. The new bus station is usually where buses from outside city will drop you off while the old bus station is where you can catch buses into the villages. Taxis tend to be high priced and not worth the cost. Your best bet is to organize a driver through your hotel and pay them for the day, although expect to also pay for their lunch.